The name “Azerbaijan” is related to the Persian word for fire and, depending on who is telling the story, it can mean “The Guardians of the Fire” or “The Land of Holy Fire.” Audio Bible listening programs are introducing the people of this ancient land to the real Holy Fire. Azeri believers are being discipled as they hear the pure Word of God, and they are not afraid to use their network of friends to invite others to discover the hope, peace, and freedom they have found. The story of two friends shows how God is using your support to bring His Holy Fire to the Azeri people. Namik decided he would pray for his friend, but not talk about Jesus for a while. Later, Namik offered Samir a Mini Proclaimer as a sign of peace between them. Each time he saw his friend, Namik would ask if he had listened. Samir would politely say that he had not, until one day. That day, Samir said, “Now, I don’t have time for this. My family broke up and I feel unhappy.” Namik replied, “In this situation, only Jesus can help you, please listen to the Mini Proclaimer.” Namik prayed with his friend, but didn’t see him for another week. The next time they met, Samir exclaimed, “How could I not accept Christ when you told me about Him for so many years? I have never heard words like I hear from the Mini Proclaimer!” Within weeks, Samir accepted Jesus and now attends Namik’s home group every week. We are thankful for church partners like Powersville Christian Church (Brooksville, KY), Disciples Fellowship (Houston, TX), Gateway on Mount Zion Church (Golden, CO), Westside Baptist Church (Daytona Beach, FL), Grace Chapel (Willcox, AZ), and many others who are helping place God’s Holy Fire into the hearts of the people of Azerbaijan as they hear the Gospel in their heart language. 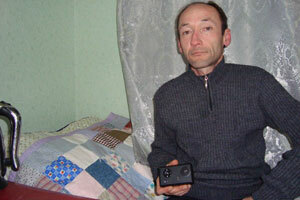 Image: Samir holding his North Azerbaijani Audio Bible.